The Guardian Unlimited has an interview with Vint Cerf, aka the godfather of the Internet, about the future of television. While mainstream television networks may have some trouble seeing and adapting to where things are going,¬†the 64-year old Cerf expects television to change rapidly, as it approaches its “ipod moment”. 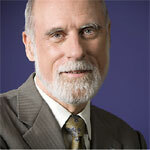 Dr Cerf predicts that we will soon be watching the majority of our television through the Internet.